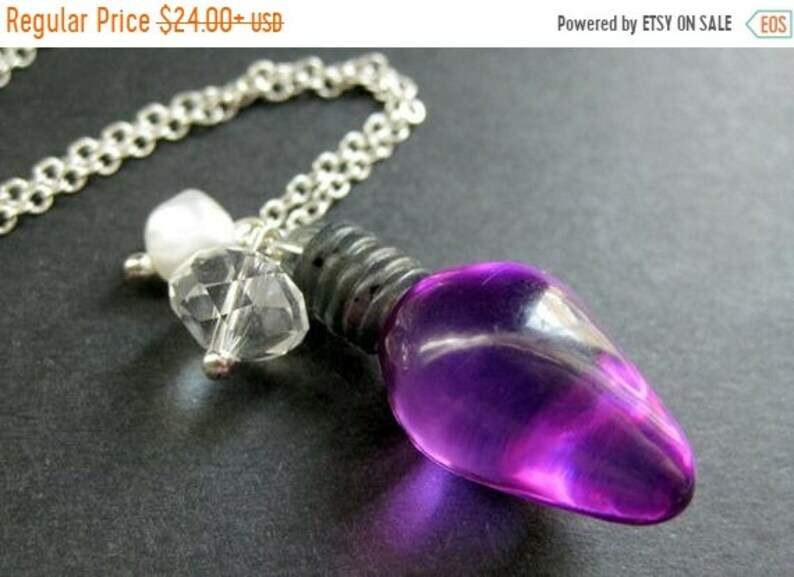 EASTER SALE Purple Christmas Necklace. Holiday Necklace. Holiday Lights with Crystal and Fresh Water Pearl. Handmade Christmas Jewelry. Purple Christmas Necklace. Holiday Necklace. Holiday Lights with Crystal and Pearl Charms. Filled with bright color and holiday cheer, this handmade charm necklace is designed with a 28mm bright purple soft lucite Christmas bulb charm that has been combined with a shimmering crystal charm and a genuine fresh water pearl. This handmade charm necklace comes with a matching silver plated chain. If you would like to order a larger quantity than what's offered in this listing, please contact me for availability! Or, stop by and visit http://stumblingonsainthood.etsy.com to see more handmade designs! Have your purchase neatly wrapped in decorative paper, and tied with a matching ribbon. A hand written gift note is optional. No invoice included. EASTER SALE Green Holiday Necklace. Christmas Necklace. Holiday Lights with Crystal and Fresh Water Pearl. Handmade Christmas Jewelry. EASTER SALE Christmas Necklace. Red Holiday Necklace. Holiday Lights with Crystal and Pearl Charm. Handmade Christmas Jewelry. EASTER SALE Eiffel Tower Locket. French Charm Necklace with Taupe Crystal and Fresh Water Pearl. Handmade Jewelry. EASTER SALE Yellow Necklace. Kissing Ball Necklace. Rhinestone Necklace with Fresh Water Pearl. Handmade Jewelry. EASTER SALE Morpho Butterfly Necklace in Bronze with Blue Crystal Charm and Fresh Water Pearl. Handmade Jewelry. EASTER SALE Angel Wing Pearl Necklace. Charm Necklace in Bronze and Fresh Water Pearl. Handmade Jewelry. EASTER SALE Eiffel Tower in Paris Charm Necklace with Amethyst Gemstone and Fresh Water Pearl. Handmade Jewelry. EASTER SALE Fire Butterfly Necklace. Butterfly Locket Necklace with Red Teardrop and Fresh Water Pearl. Handmade Jewellery. Unexpectedly huge but not overwhelming. ADORABLE !! Creamy White Flower Cluster Earrings. Off White Flower Earrings. Silver Post Earrings. White Earrings. Stud Earrings. Flower Jewelry. I love these. For some reason the design is fascinating to me. O could look at it for a very long time. Packaging and shipping timely and excellent. Cornflower Blue Dahlia Flower Earrings. French Hook Earrings. Powder Blue Flower Earrings. Lever Back Earrings. Handmade Jewelry. Red Heart Ring. Valentine Ring. Puffy Heart Ring. Filigree Ring. Adjustable Ring. Gold Ring, Silver Ring, Bronze Ring, or Copper Ring. Please contact me right away if you need to return an item. Most items can be returned for refund or exchange (usually less the shipping charges) if they are shipped back within 21 days of delivery in undamaged condition. (Note: "Undamaged condition" includes lack of odors such as cigarette smoke, perfume, etc). Please carefully and securely package the order back in its original jewelry box to protect the item from damage, and include your name and return address inside the package when returning so that I can look up your order and process your refund once it arrives. No refunds will be processed until the returned item arrives back to me. If you're interested in a personalized design just for you, or if you would like something you've seen in the shop in a different size or color, don't hesitate to send a note! I love custom orders and I am happy to work with you to create something to your specifications. When will my order ship? What do shipping charges cover? Your shipping charge covers all shipping and handling expenses including postage, envelope, packaging, and padding to ensure your purchase arrives undamaged. How long until my item arrives? Please note that all INTERNATIONAL shipping times are estimates and are not guaranteed. Delays at customs or other similar complications could increase your wait time. This is a gift, will you include an invoice? Because many of the orders placed in my shop are sent directly to friends and family as gifts, I don't usually include a printed receipt when orders are shipped. If you would like a printed invoice included in your order, please send me a note and let me know. Do you offer discounts and coupon codes? All coupon codes and discount codes must be applied to your order at check-out or they are not valid for use. Stumbling On Sainthood will not apply coupons and discounts retroactively (i.e., after your transaction is complete and your order has shipped). Wholesale discounts are available for orders significantly beyond the "bulk order" requirements listed above. If you would like this option, please contact me for item availability and a custom wholesale coupon code. What if I think that my package is lost? Please contact me immediately if you believe your package has been lost. For International Orders: Delivery times quoted by the post office are usually accurate, barring any delays that may be caused by customs issues at the country of destination. No international package will be considered lost until 45 days after your order's ship date. This ensures that there are no customs delays or other issues causing a delay in delivery. At that time, I will send you a link for you to confirm via affidavit that you have not received your item. Once completed, I will then refund your order. My order was damaged in transit! What do I do? If your item is damaged in transit, please contact me immediately so that I can do my best to resolve the problem for you! Claims of damage will require a picture of the item and its damage, as well as the damaged packaging it came in, in order to move forward. I only purchase supplies that are lead free and nickel free so that you can buy with confidence. All items listed for sale are made in a smoke-free environment. If you have allergy concerns pertaining to items that you're interested in purchasing, please feel free to contact me. I'm happy to answer any questions you may have. Please be aware that Etsy has added wording under item price in seller's listings that states "VAT included (where applicable)". VAT/TAXES are NOT included in the price of my items. I am located in the US and Canada, and I have no way to collect or pay these taxes. These charges vary according to the destination country, and are the responsibility of the importer (purchaser) if the import country's government chooses to collect them upon delivery. Items refused at delivery due to VAT/TAX will be refunded (less shipping) once I have received it back. I sincerely apologize if the wording under the price in my listings cause any confusion. Please understand it was Etsy that added this wording to seller listings, and I no way to remove it. EASTER SALE Black Cat Locket Necklace. Cat Necklace with Black Teardrop and Fresh Water Pearl. Handmade Jewelry. EASTER SALE Special Angel Necklace in Bronze with Wire Wrapped Teardrop and Fresh Water Pearl. Handmade Jewelry. EASTER SALE Teal Dragonfly Locket Necklace. Dragonfly Necklace with Teal Teardrop and Fresh Water Pearl. Handmade Jewellery. EASTER SALE Birdcage Necklace in Cream with Teal Crystal Charm and Fresh Water Pearl. Handmade Jewelry. EASTER SALE Dragon Charm Necklace. Bronze Dragon Necklace with Red Teardrop and Fresh Water Pearl. Handmade Jewelry. EASTER SALE Goth Raven Locket. Black Bird Locket Necklace with Glass Teardrop and Fresh Water Pearl. Handmade Jewelry. EASTER SALE Orange Rhinestone Necklace. Orange Necklace. Kissing Ball Necklace with Fresh Water Pearl. Handmade Jewelry.